Location map, showing Somalia and the position of the Spectrum surveys. Somalia’s offshore hydrocarbon systems have been slowly maturing since the Jurassic period. Now, after ten years of relative political peace, Somalia is set to emerge as the new hot-spot for the industry, offering not only vast reserves to match the Rovuma Basin of Mozambique, but also the most elusive of prizes in East Africa – black oil. This seismic line appeared as a double-page pull-out feature in our print magazine. If you want to get hold of our print version visit us at one of the many trade shows and conferences we attend annually (see Events). Alternatively use the 'Print Subscription' feature in the menu at the top of this page. Exploration in Somalia began onshore in 1956 with the drilling of the Sagaleh-1 well, followed by a number of wells drilled mostly in the north of the country. These clearly established the presence of a working Jurassic hydrocarbon system, as illustrated by the 1959 Daga Shabel-1 discovery well. Following successes within the Yemeni Jurassic basins during the 1980s, a great deal of renewed interest was shown in the country. Tragically, the collapse of the government in 1991 ushered in a period where Somalia remained inaccessible to exploration companies for 25 years. During this time, the majority of Somalia’s legacy geological and geophysical data were lost or destroyed. However, since the inauguration of the Federal Government of Somalia in 2012, the country has made significant advances towards political stability. As a small illustration of this progress, the installation of the country’s first ATM in Mogadishu in 2015 suggests that the country is finding stability and security and developing a new degree of civil society determined to bring peace, progress and foreign direct investment to the region. Recent positive efforts by the government to boost hydrocarbon exploration activity have been made through allowing seismic companies to acquire new 2D seismic data. An offshore 2D acquisition programme for Soma Oil and Gas commenced in February 2014, and concluded in June 2014 with over 20,500 km of seismic data acquired across a 122,000 km² area, completed with no security or HSE incidents. Spectrum is to acquire a second offshore long offset 2D multi-client survey to complement and infill the existing Soma grid. The aim is to image to 15 seconds TWT to build up a complete understanding of the rifted margin, as the record length of the existing Soma data is more limited and only captures the top of the syn-rift section in the deep offshore area (see 'foldout' above). Spectrum’s analysis of the existing and new seismic datasets, integrated with regional gravity, potential field and satellite seep data, provides the basis for the following overview of the tectonostratigraphic history of offshore Somalia, highlighting potential play concepts and prospects. 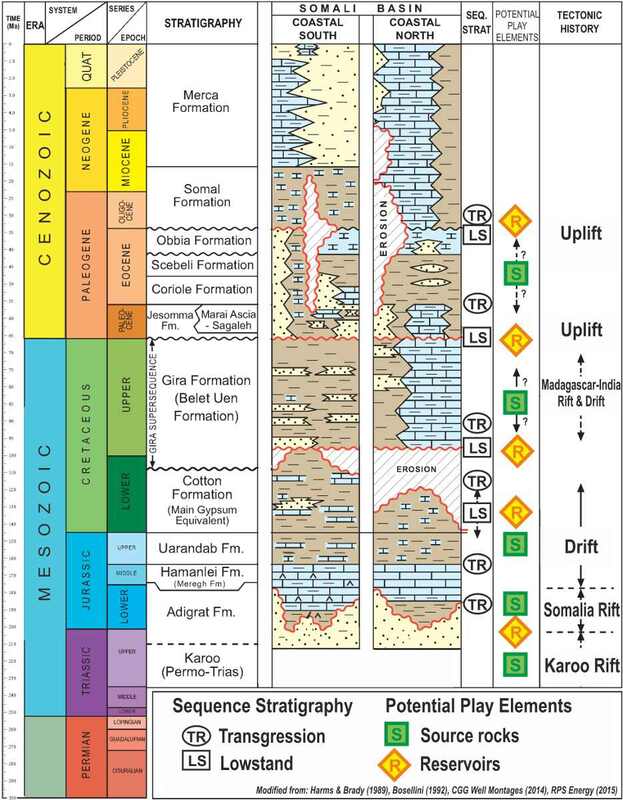 Regional stratigraphic column for the onshore and shallow offshore Somalia Basin. The initial ‘Karoo’ rifting of the Gondwana super-continent began in the Late Carboniferous, and syn-tectonic deposition of the ‘Karoo Supergroup’ continued until the Early Jurassic. This Karoo event signalled the fragmentation of Gondwana, firstly through the separation of East Antarctica from East India, synchronous with the development of an oblique rift valley between Somalia and the Madagascar- Seychelles-India (MSI) block. The Karoo is synonymous with the deposition of a worldclass source rock observed from Yemen to South Africa. Using existing well data, a moderate geothermal gradient is inferred for offshore Somalia, implying that some of the more deeply buried Karoo source rock is likely to be in the oil window. The Jurassic commenced with the deposition of the Adigrat Formation, when further rifting and subsequent seafloor spreading between East Africa and the MSI block resulted in the separation of Somalia and Madagascar, which began to drift to the south-east. The Early Jurassic marine transgression from the north saw the regional deposition of syn-rift organic-rich marine sediments in a restricted embayment, where northerly transform faults may have created partial barriers to oceanic circulation. Following the separation of East Africa and Madagascar, a period of uplift and erosion occurred during the Cretaceous as the Jurassic rift shoulders responded to unloading. Throughout the Cretaceous, Northern Somalia saw the deposition of a marly-mudstone sequence, distal to an aggradational carbonate platform, whilst the southerly basins saw increased coarse clastic input from the Jubba and Shabeelle Rivers in the Early Cretaceous, depositing a significant post-rift sequence. These Early Cretaceous pro-deltaic sediments provide a potential source rock interval in the south. Cenozoic sediments on the north-east coast of Somalia are characterised by a thick aggradational passive margin carbonate platform sequence or pro-platform marly mudstones. To the south, a number of lignitic potential source rock intervals have been observed in onshore wells, including the Eocene Coriole and Scebeli Formations. In the south, the Palaeogene consists of predominantly deltaic clastics capped by thick marls, overlain by Miocene and younger deltaics and platform carbonates. Offshore Somalia, overlain by the current seismic grid, can be divided into three basins, each defined by their own individual structural regimes: Obbia Basin in the north, the central Coriole Basin, and the southerly Juba-Lamu Basin. Obbia Basin: The post Early Cretaceous stratigraphy in this basin is primarily calcareous mudstone 1.5 to 3 km thick, which overlies very large Jurassic tilted fault block structures. In places these are crowned by carbonate build-ups, which may be comparable to the Sunbird discovery offshore Kenya. In the south, large antiformal Cretaceous to Early Cenozoic structures, interpreted as transpressional in origin, post-date dramatic Early Cretaceous gravitational slump structures, indicating that regional tectonics are significantly deforming the Cretaceous sequences. Karoo and Jurassic source rocks are a very likely source of oil for these potentially very large traps. Coriole Basin: This basin is characterised by very large scale transpressional and transtensional flower structures, forming large anticlines related to the north-south strikeslip motion of transfer faults along the Davie Fracture Zone and southward movement and rotation of Madagascar. The Tertiary is represented by a thick siliciclastic section resulting from historic avulsion of the Shabeelle/Jubba/ Tana river deltas. Using a moderate geothermal gradient it is reasonable to assume that structural and stratigraphic traps at Cretaceous and Tertiary levels are likely to have access to oil-rich hydrocarbons generated from Jurassic and Cretaceous source rocks. Juba-Lamu Basin: The Juba-Lamu Basin has the thickest post-rift stratigraphy of the three basins, up to 12 km. The deepwater post-rift stratigraphy is characterised by siliciclastic deltaic sediments, sourced by the Shabeelle/ Jubba/Tana river deltas. The Cenozoic section in the west is characterised by very large gravity slides on multiple décollement surfaces, which may be coincident with early mature organic-rich mudstones. These are the same mudstones that were reported by Pan Continental and partners as the main source for the oil in the Sunbird discovery. Additionally, these slides have created large, stacked toe-thrust structures downdip, analogous to the areas of significant success in the Rovuma Basin, offshore Mozambique (see 'foldout' above). Beneath the décollement surfaces, thick Cretaceous clastic-rich sequences of apparent basin floor turbidite fans are draped over tilted fault blocks and stacked postrift mass-transport system deposits. The similarity of this section to the outer regions of the Rovuma Basin east of the toe thrusts is striking. The main difference appears to be the lack of a Karimbas Graben equivalent down dip. The potential for oil in this section will be critical to exploration interest. A significant observation from Spectrum’s preliminary satellite seep studies is the identification of an active oil seep located directly over the toe-thrust structures where some of these features come close to seabed. The correlation of active seeps to subsurface geology is considered key to risk reduction and therefore these studies are continuing as new data are acquired. 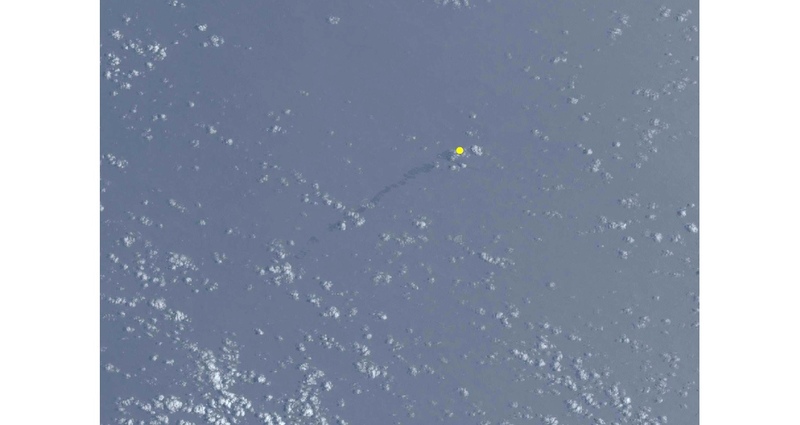 Oil slick from an active oil seep thought to be located directly over toethrust structures offshore Somalia. 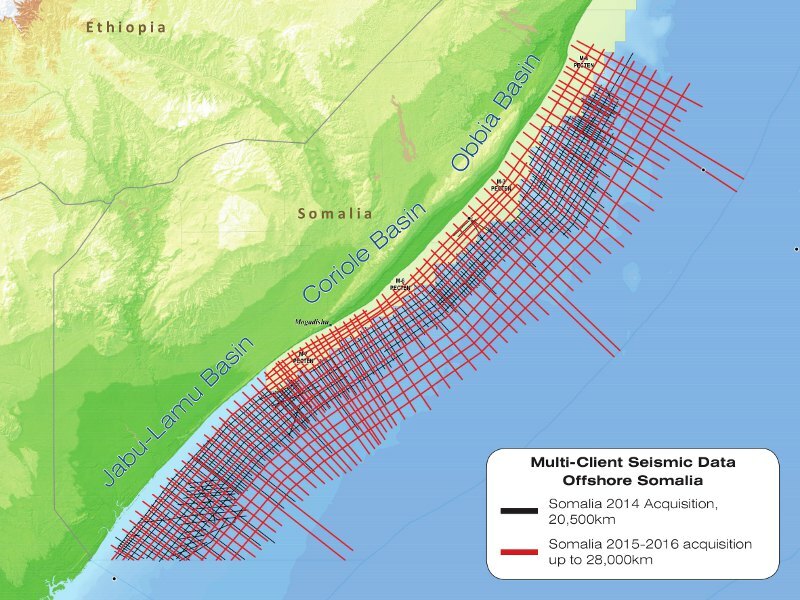 New seismic data from offshore Somalia are revealing extraordinary structures, in an oil-prone frontier province that has never been seen or explored before. The data correlate closely with the potential field results, and the most recent seismic is imaging gigantic structures that have never been mapped before. Striking resemblance to the astonishingly successful plays in Kenya, Tanzania and Mozambique indicate that offshore Somalia is about to become the hottest area offshore East Africa, with not only the promise of huge hydrocarbon potential, but also a strong indication that this time the hunt is on for black oil. Re-imaged 2D regional seismic will lead to a better understanding of the Trinidad-Tobago and Barbados region and promising new opportunities in the search for hydrocarbons. Recent studies on new data conducted in collaboration between BGP, TGS and OMNIS confirm there is significant potential for future oil and gas discoveries offshore the West Morondava Basin.